By Carter. Image by Sarah Shatz. I am so excited to introduce you to Françoise Mouly today! 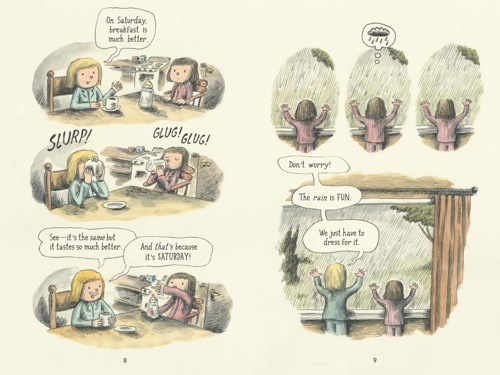 You might know her work as the art director of The New Yorker, but she’s also the founder and publisher of TOON Books, a collection of comics and graphic novels for early readers. Her vision for kids having access to well-designed comics is innovative and inspiring. It’s magical! And radical! On top of that, she’s a mom doing a fantastic job of infusing her career with the needs of her kids. What an honor to bring her words to you today. Enjoy! 1. You’ve said, “comics are a gateway into literature.” I love this! What can comics do for kids that other books can’t? And could you speak to the complex relationship between pictures and words within those pages? In many ways, I’m working off of what I saw when our two kids learned to read. They’re both bright kids who were surrounded by books, with the same parents who love to read, but each child went about it in his or her own way, within his or her own timeline. They both loved comics, but it was clear to me that comics were what got our son hooked on reading — that’s when the lightbulb went on. I realized you can’t force someone to enter into the world of literacy. It’s far too complex a set of skills — the child has to want to make the story happen in his or her head. With comics, you provide a clear path to get through that thicket. Comics have a unique ability to draw young readers in through their visual narrative flow. 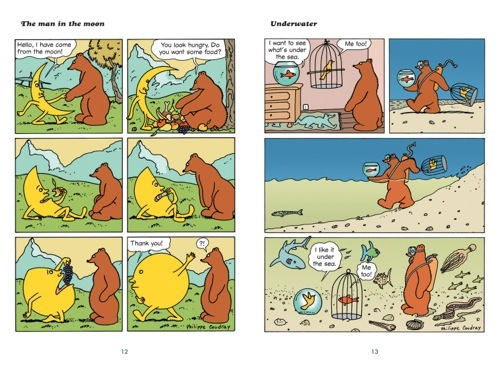 In comics, pictures are acting as words, and those ‘words’ are instantly understandable to kids. They’ll follow the flow of the images, wanting to know why this character is angry, and why this one is crying. They move on the page from left to right, from top to bottom. They effortlessly read many elements of comics storytelling: the size and shape of the panels shows what’s important, the sound effects provide a parallel track; with the speech balloons, they see written dialogue as a transcription of spoken language. Most of the issues that emerging readers struggle with are instantly clarified by comics’ simple and inviting format. You’ll forgive me if I get excited, but for beginning readers, comics are pretty close to a magic bullet! 2. Can you tell us a little bit about your mission and hopes for TOON Books? We want to share our love of books with new generations as they come of age in an increasingly visual culture. The more there are digital assaults on our kids’ attention, the more they need books, good books. With comics, kids can take charge, can be at the wheel. Watching kids devour our TOON books should convince any skeptics left in the house of how entertaining reading can be. The TOON’s open a child’s eyes up not just to comics, but to any book’s pleasures, so it’s very important to publish books that will withstand repeated readings, books that are beautifully produced, and put them in young children’s hands. Years ago, I was passionately arguing that “COMICS — They’re not just for kids anymore!” But now that comics, in the guise of “Graphic Novels”, have acquired legitimacy — now that they are in libraries, museums, and bookstores — I’m just as passionately arguing that comics must not, in their bid for respectability, leave children behind. “COMICS — They’re not just for grown-ups anymore!” That’s my new slogan! 3. Is there a cover of The New Yorker or a particular illustration that you would consider your favorite piece? I take pride in the fact that the covers have not gotten predictable, that in the 20 years I have been in charge, it hasn’t settled into a “New Yorker” cover style. I’m proud of so many great covers, and of the range of artists we publish: David Hockney, Robert Crumb, Barry Blitt, Maira Kalman, Bruce McCall, so many geniuses. I get to work with the best artists of my time; it’s a real privilege. 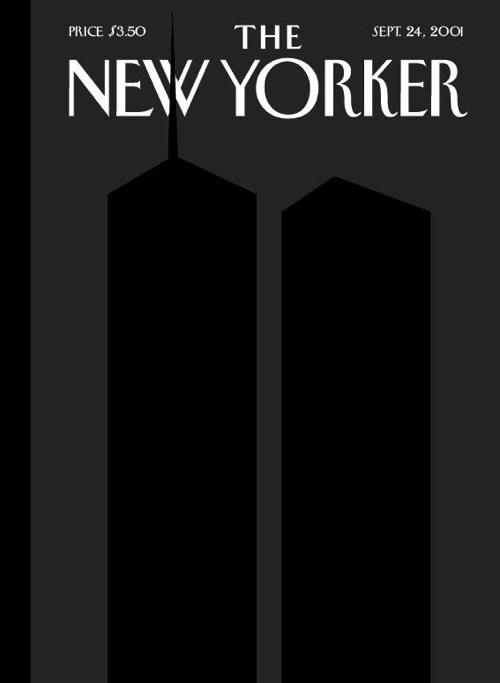 But still there’s one cover that’s more meaningful to me personally than most, and it’s the one I did right after September 11 with my husband, Art Spiegelman, the black on black silhouettes of the towers on a black field, a cover both simple and complex. It was a turning point for me because the stakes were so high. I felt I couldn’t possibly succeed, that no drawing could possibly capture what we were going through at the time. The image was born out of that negation. I accepted what I felt, my feeling of utter powerlessness and that’s what I sketched. The fact that my inability to come up with an image was the path to just the right image was a great lesson. 4. What physical objects, places, or people inspire you to create art? I treasure new ways to look at something I thought I knew. I love going to museums with Art, my husband; he’s such a good observer and explainer of what he sees. Looking at art makes me want to rush home to try something, anything with paints. Also sitting in nature, looking at trees, or at a brook. Anything can be a trigger, because when you do something you put all of yourself into it. You don’t partition and think: “This came from art school, this from this morning’s subway ride, and this from what my kid just did.” You simultaneously process everything you go through, so contemplative moments are good triggers. When I take in something in fully, I get so excited it makes me want to create something new. 5. Your life’s work is truly at the intersection of design and motherhood. How does mothering influence your creative work, and how does your work as an artist speak to your parenting? I feel I became much more myself when I became a mother. Before, I didn’t always have the confidence of many designers or artists, to say: “Look at what I did! It deserves your time and attention.” Once I became a Mom, I was fearless. I had the responsibility to decide what my kid will eat for dinner, what clothes she’ll wear, what school she’ll go to. It’s such an awesome responsibility to be a parent — I had to trust myself in order to live up to it, and that helped for a lot of the creative work. Confidence in yourself is key – you can only initiate something new if you believe in it. And I’m so proud of our kids, I’m not objective on the topic, but I think artists can make good parents because they naturally encourage risk-taking and they value figuring things out for yourself. 6. I’m always curious what creative professionals love to do in their spare time, because I know how tough it is to turn off that side of your brain in off hours. How else do you view the world besides through books and art? You’re right that there isn’t a separation between work and “not-work.” The best ideas come in the shower, or on the bike, or even while you’re asleep. Between The New Yorker, the TOON Books, and being in charge of my household, I end up having to be very disciplined to make room for all that I have to take care of. Often, I’ll try to do everything else first and wait til everyone is gone to close the door so I can focus on the creative work. The best times are usually when I can spend a day or two to hike, bike, swim, any repetitive movement, read, draw, empty my head: that’s fuel for many days afterwards. 7. I read an article that mentioned your desire to leave a legacy of print books and magazines as a means to “fossilize the moment.” That is such a lovely sentiment, and I’d love to hear you expand on those thoughts a bit. One of the artists I work with, Frank Cammuso, pointed out that he can’t pull out an iPad at bedtime with his three-year old. An iPad is a window on an endless stream of excitement; it’s not a place to focus and prepare for sleep and dreams. But a book is! A book can be read every night and it will always be the same and different. It will be what your Dad read when he was a kid, and what you’ll read to your children. It has some elements that don’t change yet it’s a new adventure every time you reread it, because reading is truly interactive and the reader is half the story. All day long, I spend my days on a computer, making and manipulating images, reading and writing emails, finding information. A computer is a good tool, a means to an end, but spending so much time online makes me very aware of how special and valuable any ‘old media’ is, anything that is printed, frozen, preserved in one form, fossilized. It’s there to be interpreted. Every time you spend time with it, it remains the same yet it becomes something more. Whenever I hear from people say that Silly Lilly, Benjamin Bear, A Trip to The Bottom of the World, or any of the TOON Books has become their child’s favorite book, read night after night, I feel hopeful for the future. 8. What were your favorite books as a kid, and do you see threads of those stories lingering in any of your creative or family work today? Funny you should ask, but next year we’ll be launching a new series, the TOON Graphics, for children a bit older, 9-12. One of the first books in the launch is a comic I read when I was that age, Philemon by a French artist named Fred. At the time in Paris, I didn’t know anyone else who read it, didn’t have anyone to talk to about it. But now it’s everywhere in my house, where the TOON office is. I look around and I see my husband, my children, and the young assistants who work at TOON, all reading a comic strip I loved when I was a kid, and I feel I’m doing something right. I’m incredibly lucky to be in a position where I can make lots of people discover a work I loved when I was twelve, and which seems just as good now. Isn’t she remarkable? After this chat, I wanted to rush out to an art museum, take a stroll around the block, and curl up with an old favorite book. All at once. Somehow her inspiration makes me feel like all of that is possible, and somehow I love the notion of story even more now. Did her words resonate with you, too? I keep thinking about how the reader is half of the story, and how books are new adventures with each reread. I know a ton of little readers that will devour these books, and an equal number of grownups that will swoon over the art! So here’s to story, to art, and to family legacy! P.S. — Find all the posts in our Author Interview Series here. Ahhhhh! I loved this! Thanks so much for posting this wonderful interview. Francoise and her husband Art are two of my idols. My kids will definitely be getting TOON books for Christmas. I’m so happy to get to know this amazing designer! I agree about the comic books–I credit my son’s advanced reading skills to his hours spent reading Tintin comics. I can’t wait to introduce him to the TOON books! Thank you for this post. It is inspiring. I love that she talked about how being a mother helped her in her career. I share the idea. What a lovely and inspiring interview. I used to be hesitant about comics and graphic novels, but my family of all boys simply devours them. I will definitely have to invest in TOON books. And I agree with what she says about motherhood making you bold. Motherhood has given me the confidence to be in charge of my household and my life, and take much bigger risks in my writing. What a great interview. Her sentiments about motherhood making her fearless are so inspiring. Really looking forward to more in this series, glad to see it making a come back. And super yeah for the soon-to-be works for 9-12 year olds. My older kids can’t wait! I found this article very inspiring, and interesting that while some women question their abilities in the workplace after they become a mother, it has had the opposite effect on Mouly and made her fearless which I thought was great! The part about; “spending so much time online makes me very aware of how special and valuable any ‘old media’ is” resonated with me most, as I am online all day for work, so books, magazines and paper goods like cards especially the handwritten Thank You note means so much more to me now. Can’t wait to read more of your Author Interviews! She is going to be presenting at a workshop at The Jewish Museum on Friday. I can’t wait to hear her speak. I LOVE this interview. Her remarks about the intersection of confidence, self-ownership, creativity, and becoming a mother=fantastic. I ‘m a big fan of the French Festival of the Comic Strip held every January in Angouleme, Charente, France. Art Spiegelman curated it in 2012 and it’s an epicentre for drawing and the comic strip in all it’s genres. A must-see for creative spirits. Lovely interview! It was the graphic novel that made the light bulb go off in my daughter’s head as well. Benny & Penny was one of the first that she read cover to cover… by herself. Thank you Françoise for such a fabulous addition to the genre. Sometimes I forget to lead a creative life. I get all caught up in the hubub of work or whose turn it is to do baths. But then I read interviews like this and new life is breathed into that part of who I am. Loved this interview. It’s the kind that will stick with me for while, reminding me to slow down and take the time see the beauty and art in what I experience. THANK YOU! LOVE TOON books! Thanks for bringing us a wonderful interview, Carter! What an amazing interview! Thanks for leeting me know of this great women and designer. She is really inspiring! Now I would like to know how to turn my career into publishing books for children!!! Regarding comics for children, I can suggest “Manu en la playa”, by Ed and Diego Arandojo for Mamut Comics. Without words, it was a great discover at home with my children. What a wonderful interview! I’ve seen a few of those books and it’s great to hear the story behind them. Benjamin Bear is now the “thing to read” for my 4 year old son’s Christmas list. 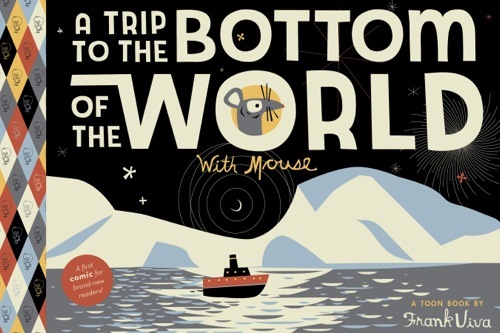 I also love when you find those connections and how amazing that she is married to Art Spiegelman! I read MAUS I and II in 4th grade and loved them, though maybe they were a bit above my pay grade at the time. 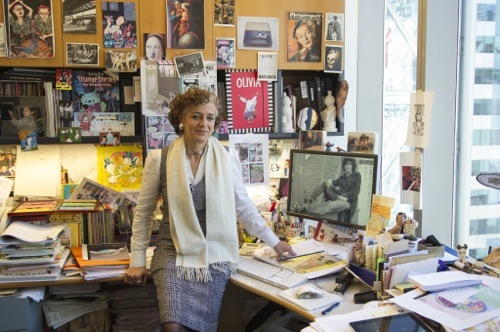 I didn’t know Françoise Mouly, just a few things about her work around the covers of the New Yorker, so thank you! I didn’t know Mimi Cracra was Silly Lilly for English speakers! So funny to discover it! Love this little “not perfect” girl! Lovely. Thank you for sharing, Françoise and Carter. I feel like I’ve just been given a gift…truly. My oldest three learned to read quickly and easily, but for my youngest it’s been a struggle. But every night she loves to read a battered old book of Garfield comics. This will probably make me sound terrible, but I’ve felt like I needed to get her past that into “real” reading. But Ms. Mouly’s thoughts on the subject are truly inspired. Funnily enough, my daughter’s name is Lily. Maybe she’d like to meet “Silly Lilly?” Thank you, thank you for this new way of looking at comics. What an inspiring post! One of my favorite lines: “Once I became a mom I was fearless.” What a fabulous point of view and a reminder of the power of motherhood . . . and art.